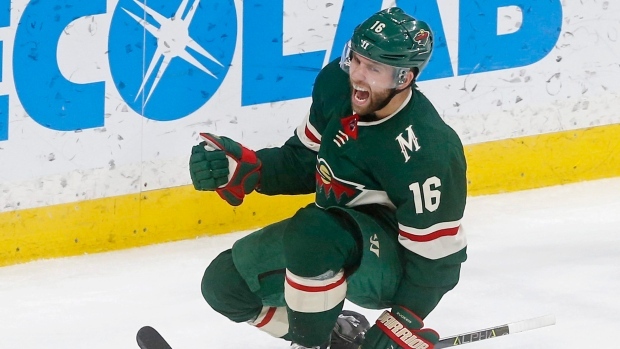 Jason Zucker scored late Tuesday night to help the Minnesota Wild in their comeback victory over the Winnipeg Jets, but it appears he came close to playing elsewhere one day earlier. According to TSN Hockey Insider Pierre LeBrun, the Calgary Flames were "really, really close" on a deal to land Zucker ahead of Monday's deadline but the trade fell through. LeBrun told That's Hockey on Tuesday that neither team is believed to be pleased that the deal did not go through, though it remains unclear exactly why. TSN Hockey Insider Darren Dreger also reported Tuesday that a Zucker-to-Calgary deal fell through, and added Flames general manager Brad Treliving was extremely unhappy to come away empty handed. "I think it was a timing thing," Dreger told TSN Radio 1050 Toronto. "But I haven't gotten through all of the details coming out of Calgary. "Because I can tell you this - and you know this Craig [Button] because you've lived it, and things have gotten more smooth over the years electronically - but there was a logjam - as there always is - but there was a jam-up at Central Registry. "So maybe it was just an issue of the queue being too long. But normally what happens is as long as the trade is filed, they still honour it, you just have to go through the process. "We'll dig a little deeper and find out what the backstory is, but I know Calgary wasn't pleased at all." Flames vice-president of hockey operations Don Maloney told TSN on Monday that a "significant" move also fell through for the team on Sunday night. The Flames, who lead the Western Conference with 87 points this season, added only defenceman Oscar Fantenberg at the trade deadline.